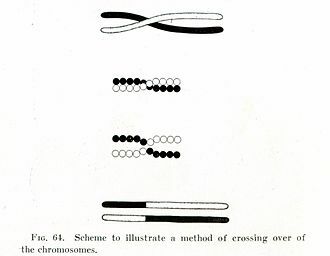 I have heard that during meiosis, homologous chromosomes from each parent "cross-over", which enables the off-spring to inherit some alleles from the mother and some alleles from the father. The picture below illustrates this "cross-over", but of course this must occur at multiple sites, rather than just the one shown in the picture. Now my question is what causes the chromosomes to align perfectly during cross-over so that the loci of a particular gene will substitute for the corresponding loci on the homologous chromosome, as opposed to being substituted with a completely random locus? Does each gene have a unique non coding sequence before it specifying what gene it is to enable this process to occur? Quite simply, because chromosome pairing is sequence specific. Holliday Junctions, which are the functional structures of a cross-over, occur through a process called "strand invasion," during which a region of one chromosome physically base-pairs with that of another. Thus one locus cannot pair with a random locus, as there is generally insufficient sequence complimentarity between two random regions to form a functional Holliday Junction. One interesting consequence of this mechanism is gene duplication and deletion in repetitious regions of the chromosome. For example, genes with large repeated regions, such as the gene responsible for Huntington's disease, can expand and contract during homologous recombination due to strand invasion occurring at non-equivalent, but still homologous, sites. Wikipedia does a nice job going over homologous recombination. I also recommend looking over the relevant sections in Molecular Biology of the Cell, available on the PubMed Bookshelf. How do two parents, recessive and dominant genes and two complimentary nucleotides end up in one DNA? What is a “homologous pair” of chromosomes in cross joining or cross over? What is the relationship between independent assortment and cross over?